Patna: Launching a fresh attack on Nitish Kumar, Rashtriya Janata Dal (RJD) chief Lalu Yadav today said the Bihar Chief Minister has "no say" in his own government as he had "fallen into the trap of the BJP". At the RJD executive meeting in Patna yesterday, Lalu Yadav took a dig at the Janata Dal (United) chief's efforts in maintaining a clean image and his move of leaving the Grand Alliance to join the NDA. "Chhavi Kumar's image has taken a beating. He has sold out his principles. Now, he has fallen into the trap of the BJP. 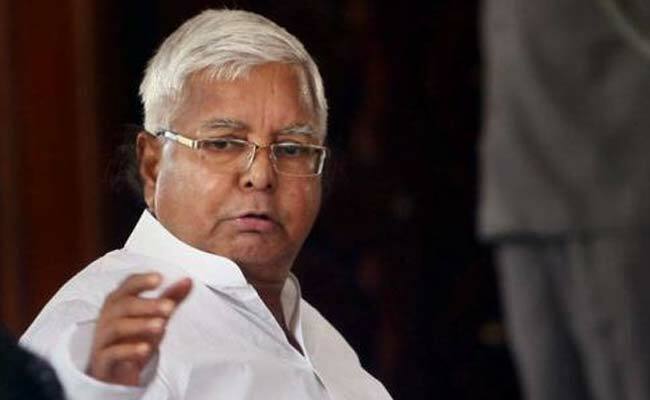 Palturam now has no say in his own government and he does not have a way out," Lalu Yadav said. He said he had been apprehensive about naming Nitish Kumar as the chief ministerial candidate of the Grand Alliance during the 2015 assembly election. "Nevertheless, I decided to take the risk as we had to stop the BJP. I got his candidature announced by Samajwadi Party leader Mulayam Singh Yadav, who was the senior-most among us. But Nitish ditched us," the RJD leader said. Reacting to alleged corruption cases, in which he and his family members have been embroiled, Lalu Yadav said, "Nitish and the BJP may keep hatching conspiracies. But they will not be able to harm Lalu and his family." He alleged members of the ruling JD(U)-BJP alliance in the state were "involved in massive corruption". Former Bihar Deputy Chief Minister and Lalu Yadav's son Tejashwi Yadav, who was also present at the meeting, attacked Nitish Kumar over the recent hooch tragedy in Rohtas district. "His (Nitish Kumar's) policy seems to be -- let people die and then wash the hands off with a compensation of Rs 4 lakh," he said. Four people had died after consuming spurious liquor in Danwar village of Rohtas district on October 27. The Grand Alliance government in Bihar, comprising the RJD, JD(U) and Congress, had imposed a complete ban on sale, manufacture and consumption of liquor in the state in April, 2016.